Hyatt Regency recently opened its first property in the capital of China – Hyatt Regency Beijing Wangjing – marking the brand's debut in Beijing. The 348-key hotel is set in an urban environment with energising, intuitive experiences and a deep connection to design and nature. "As the first Hyatt Regency property in Beijing, we are proud to bring upscale hotel hospitality into the Wangjing area," said Till Martin, general manager of Hyatt Regency Beijing Wangjing. "The dynamic energy and growth in Wangjing is exciting for us as we expect the Hyatt Regency brand will create a seamless connection between our guests and the very best that Wangjing has to offer." Set to be a landmark within the district, Hyatt Regency Beijing Wangjing is situated at the juncture of the new Central Business District and a charming residential area. As the new centrepiece of the area of Wangjing, the hotel projects the very core of Wangjing's unique culture, from its history and local community to its ever-changing and modernised look today. Strategically located in the heart of the Wangjing Central Business District, the hotel is conveniently accessed via the Airport Express and is a short stroll from the Futong subway station on Line14 and the 798 Art District. Beijing's excellent underground transportation network provides easy access to shopping on the hip Nanluoguxiang Street, the nightlife hub of Sanlitun, Olympic Park and other popular sightseeing and lifestyle destinations. Designed by award-winning architect Kengo Kuma, the hotel's architecture is inspired by the Chinese "Sanhe Yuan," a three-sided courtyard style home embracing a green garden. 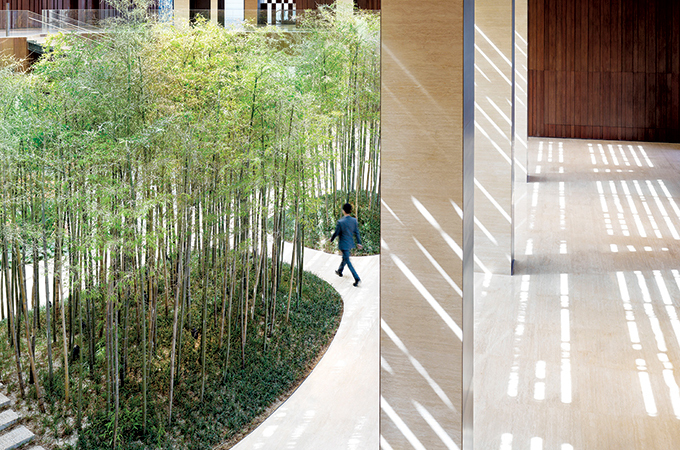 With its unique location between green parks, Kengo Kuma has created an "urban forest" defined by a contemporary chic design and natural materials as a refreshing backdrop to an intuitive hospitality experience. As biophilic design, known to incorporate natural materials, elements and views, is deeply engrained in the hotel's design, the interior space is coloured with natural materials giving its visitors a rich experience. The lobby space is full of natural light through oak louvers underneath a large glass skylight. With green bamboo landscape and natural travertine, marble, granite, oak and walnut throughout, it feels like taking a walk within a conservatory. The hotel's oriental aesthetic and biophilic design extends to its restful guestrooms. Oak wood, beige marble, green marble, wood grain patterned carpet - all the materials give a warm and cozy impression, creating a warm sanctuary with soft atmosphere as well as great views to surrounding greenery. Impressive pieces of nature are implemented throughout the hotel to create a cheerful lasting memory of the guests' time in the "Sanhe Yuan." The hotel not only nurtures each guest's mind and spirit, but also crafts an intuitively warm hospitality experience in every aspect. Confident guests can reward themselves after the work day with a gastronomic journey where five tempting restaurants and bars offer locally inspired delicacies as well as international fare. Hyatt Regency Beijing Wangjing boasts a total of 60,277 square feet of creative spaces designed for inspiring conferences and social events, among which is the Regency Ballroom, an impressive 14,746 square-foot event space with breathtaking views amid lush greenery. The space is versatile enough to host any event from business lunches to romantic weddings. An experienced team of event professionals will create an effortless experience that meets every individual need. Buy breakfast and get a room for free!